Culture plays an important role in Görlitz. Regular cultural highlights, such as the Old Town Festival, the Day of the Open Monument, the Summer Theatre, the viathea Street Theatre Festival, the Silesian Christmas Market and many other events have become popular attractions. Not only locals, but also visitors from all over Germany and from abroad come here to enjoy these events. Furthermore, numerous museums and galleries invite their guests for a visit. The theatre presents a wide range of cultural offers covering music theatre, plays, concerts and dance. The beautiful building of the Görlitz theatre – called the „Little Semper Operahouse“ – is home to a music theatre with all its facets including opera, operetta and musical as well as the dance company and the New Lusatian Philharmonie, the region’s only philharmonic orchestra. The Görlitz Museum of History and Culture displays its precious collections in three different buildings, all of them listed architectural monuments; there are permanent and special exhibitions as well as cabinet exhibitions. Visitors are invited to go on a journey through time covering 14,000 years of the region’s history and culture. The Gallery of Modern Arts shows about 200 works of visual and applied arts from the 20th and 21st centuries. The exhibitions present bourgeois Baroque culture as well as art and science around 1800. The impressive backdrop library is the biggest active library of the city containing 140,000 volumes of books of historical and regional importance, among them the world’s most comprehensive collection of works by the Görlitz theosophist Jakob Böhme. The tower used to be part of the old city fortification and is a viewing tower today. The tower used to be part of the old city fortification and serves as a viewing and exhibition tower today. The EUROPE CHOIR ACADEMY was established in 1997. This highly appreciated concert choir incorporates a network consisting of several hundred young singers coming mainly from Europe. The repertoire ranges from 18th-century oratorios to contemporary music. 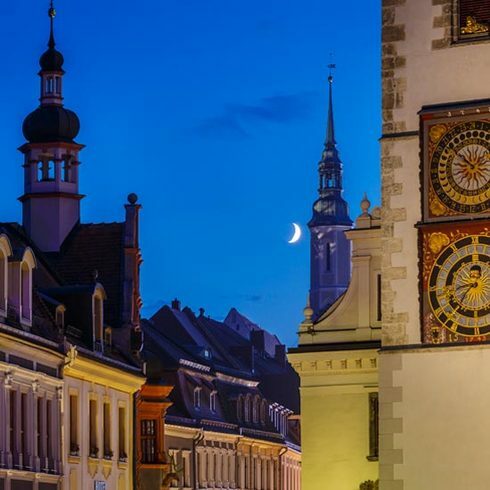 900 years of Silesian history, traditional craftsmanship, precious Renaissance architecture plus an exhibition presented in modern design – that is the Silesian Museum in Görlitz. Especially the dialogue on Silesia’s past and future is a matter of particular concern to the museum. Dioramas designed to have a near-natural look present the diverse and beautiful habitats in Upper Lusatia. Visitors can experience nature face-to-face with wolves and other inhabitants of the region. The vivarium, the rain forest and savannah exhibitions as well as the soil column are further highlights of the museum. The former Upperlusatian Commemoration Hall was built between 1898 and 1902 to be a mighty symbol of the unification of Germany and Upper Lusatia. The Emperor-Friedrich-Museum (Kaiser-Friedrich-Museum) located here used to accommodate numerous collections. After the Second World War, the Museum was liquidated. Since 1948, the building has served as a house of culture. Jacob Böhme, the famous shoemaker and theosophist, lived in this house for eleven years (from 1599 to 1610). The building accommodates a small permanent exhibition about his life and work. Also the tourist information centre of Zgorzelec is located here. The museum is dedicated to the history of Eastern Upper Lusatia focusing on Zgorzelec and its surroundings. You can have a look at the „Lusatian Room“, for example, showing items of daily use from the 18th and 19th centuries. The former prisoner-of-war camp Stalag VIII A is located at the southeastern edge of Zgorzelec. 120, 000 prisoners were registered there between 1939 and 1945, among them the French composer Olivier Messiaen. During his imprisonment, he created his masterpiece “Quartet for the End of Time“, and performed it for the first time on January 15, 1941, in the camp. Today, the European Centre for Education and Culture commemorates the history of the camp and organizes concerts, for example at the Meetingpoint Music Messian.